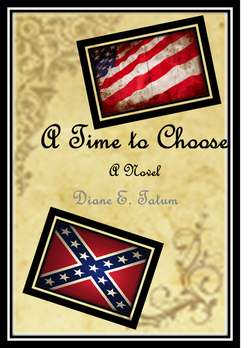 Teaser for A Time to Choose, Diane's new novel! Hero Captain Andrew Scott Browning has been transferred from an outpost in the West to a new position and rank in Washington, DC. He arrives in January 1861 and is assigned the charge of security in the White House. As a Virginian and acquaintenance of Col. Robert E. Lee, he is faced with the prospect of Virginia's secession from the Union. His family and fiancee live on the Virginia Peninsula. What will he do if Virginia secedes from the Union? This choice is the first of many choices Andrew must make during the course of the CIvil War. Heroine Maggie Strickland arrives in DC on the same day as Captain Browning. She has arrived from Boston, Massachusetts, as a representative of abolitionists. She has a petition to deliver to the new president, Abraham Lincoln, to free all slaves. As a graduate of Harvard with a degree in political science, she is also journalist writing a political editorial column. As a woman in a man's world, she takes a nom de plume, DC Strictline. Prayers for a publisher are greatly appreciated!